There are certain things in life that one considers to be truly delightful – they are different for us all. For me, a strong coffee coupled with a crunchy biscuit or flaky pastry, preferably of Italian extraction, is one such delight. However, since moving away from my favourite coffee shop in Aberystwyth, obtaining such a treat has proved a little trickier. 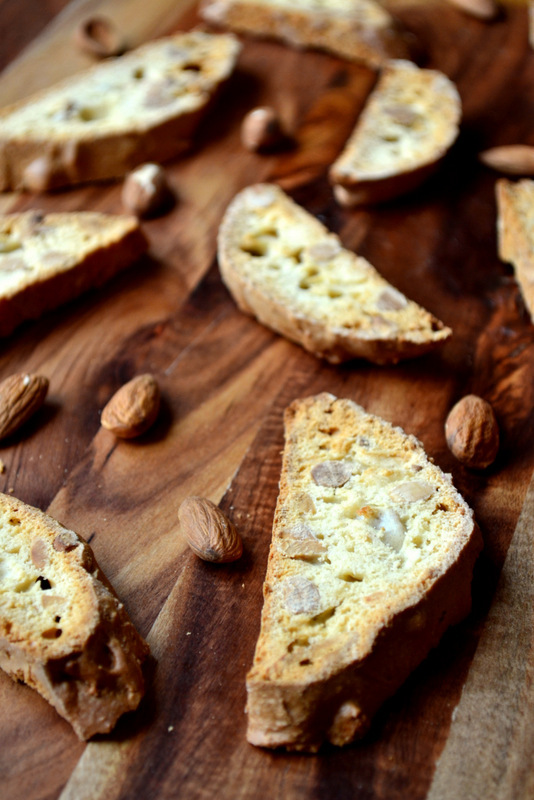 Happily, almond biscotti, the traditional Italian biscuit, are jolly simple to make – so there are no excuses not to follow this frugal recipe! Twice baked for longevity, the origins of biscotti lie in protracted journeys – though, like many great inventions, they have succeeded in transcending the boundaries of their original purpose. Indeed, it seems reasonable to state that biscotti (and not only the almond variety) have gripped the hearts and coffee habits of many the world over and it isn’t difficult to see, or rather to taste, why. As any self-respecting coffee drinker will tell you, our caffeinated friend is at its heavenly best when avoiding the sweet. Of course, biscotti do contain sugar, but they remain a long chalk from the tooth-rotting standard set by the American cookie – a standard which has, reportedly, seen the Cookie Monster require a full set of dentures. Clearly, these Italians knew what they were doing – which will perhaps come as a surprise to some. Unfortunately, as delicious and healthy as they are, nuts can prove a little weighty on one’s financial burden if one isn’t careful. However, steps can be taken to ensure frugality! Indeed, to make the most of the contents of one’s wallet it is best to purchase almonds in their raw form (200g for £1.50). This also serves to improve their versatility, as it is possible to roast and blanch them on a whim. Check out the recipe below for instructions and do enjoy these delicious Italian biscuits. 1. Simmer the almonds in a pan of hot water for no more than a minute. Strain them and pop the nuts out of their skins. Throw them into a baking tray and roast until golden brown at 180C. This should take 8-10 minutes. 2. Sieve the plain flour into a large mixing bowl and add the sugar, baking powder and salt – mix thoroughly, form a well in the middle. Whisk together the milk, egg and extract and pour into the well along with the almonds, roughly chopped. With a fork work this into a dough. 3. Turn the dough out onto a lightly floured surface, it should be very sticky. Knead it a little and form into a ball. Place this onto a greased and lined baking tray and form into a log roughly 9 inches in length – pat down slightly. Bake at 180C for 20-25 minutes, until hard and golden brown. 4. Using a bread knife diagonally slice the log into sections roughly 1cm wide. Place them back on the baking tray and cook at 150C until hard and brown remembering to turn them half way through. This should take no more than 15 minutes. Leave them to cool a little before scoffing. Cost: We got a ridiculous deal on our almonds – 600g for £2 – but that really was an anomaly, so the price will reflect normal market conditions! 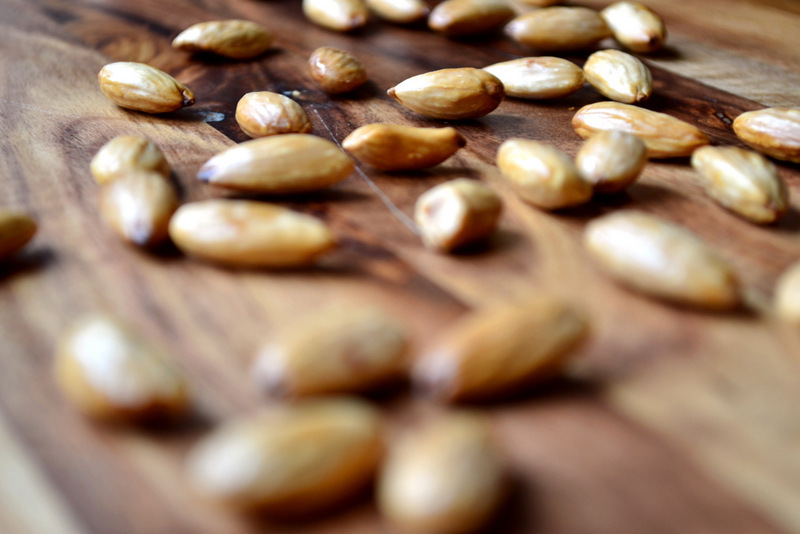 Indeed, assuming you haven’t procured your almonds quite so frugally, following this recipe to fruition should set you back around £1 which still isn’t half bad! Enjoy them and make sure to brew a jolly strong-armed coffee! Almonds are my favorite nut to bake with, and I always have a hefty supply of them in my freezer. Can’t wait to try this biscotti recipe – I’ve only made biscotti once before and it used pistachios and cranberries – very good too! Mine too, I think… Oh you have to try almond biscotti – it’s the way biscotti should be. Very amusing post. Love the photographs. Please do! I hope you enjoy them. Thanks! So glad you made them. 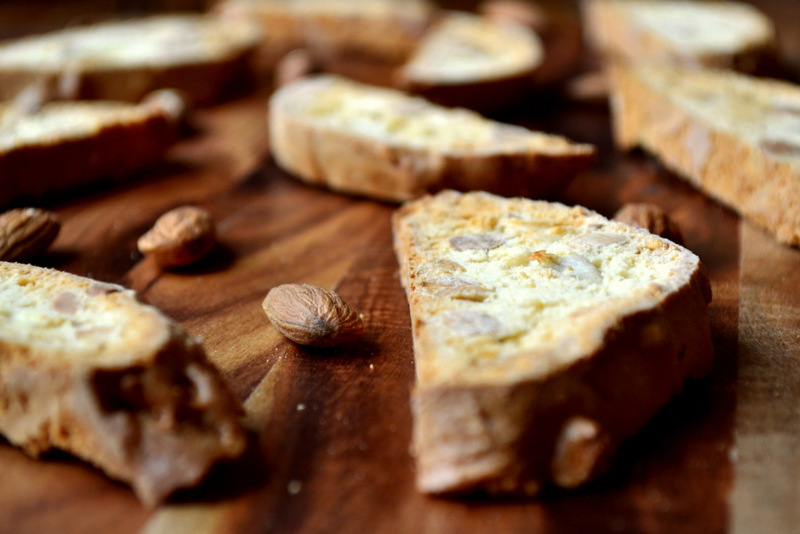 Love almond Biscotti, lovely photos! Thanks – it’s not too tricky really! I’ll see you for a coffee date. Those look amazing. Feel free, though you do live rather far away! These look absolutely amazing! Will have to try these for sure!! I was just thinking the other day how I needed to make biscotti and then you go and post about almond biscotti. So delicious. So simple. Perfect with coffee. Looking forward to trying this! We’re totalling connected 😀 haha. Enjoy them! Please do – you’ll love them. Will do. I didn’t get round to making them the other day so I’m going to try them tomorrow. Biscotti keeps quite well, doesn’t it? I’ve never seen a biscotti recipe, This looks wonderful, I’ve shared! These look so good. Never made biscotti before. Thanks! Thank you for commenting and paying such wonderful compliments. YUM! 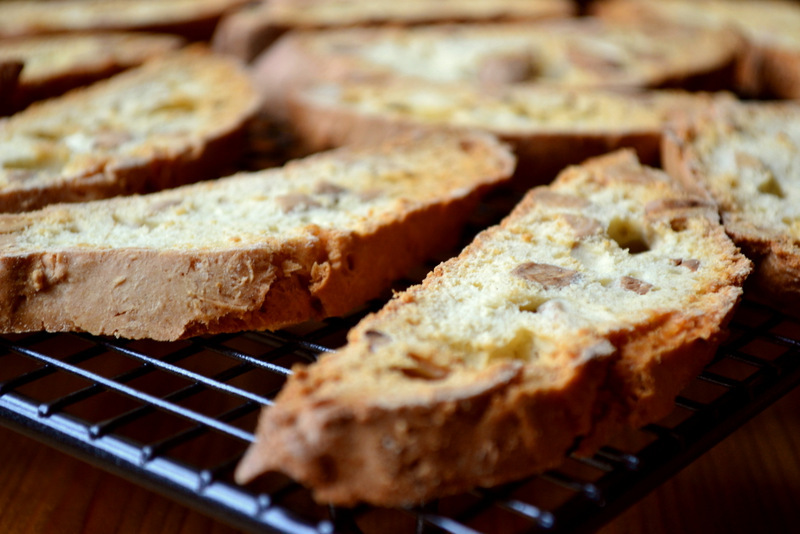 I love biscotti and this looks like a great recipe! Can’t wait to give it a try! Thanks, Sarah! Let me know if you like them! Yet another jab at us poor over-sugared Americans… However, I cannot say we don’t deserve it… I held a rather unfortunate post at a Starbucks drive through store for a while and made enough 600 calorie drinks to know it’s an accurate stereotype, at least for part of our population! Think a biscotti would go well with a coffee of that type? 😉 I made my first almond biscotti a few christmases ago and fell in love at first crunch. I love how ‘rustic’ yours look! Haha – every jab pains me more than it does you! I’m sure it would, but the biscotti wouldn’t be happy… Thanks – as you may have discovered, I like rustic. Haha – very well, you may 😀 – I’m glad you think they wouldn’t! Look great. Italians are very sweet-toothed too, but I think they approach it in a different way to Brits or Americans. The quintessential breakfast is coffee and cornetto, which is similar to a croissant except full of sugar! (Or indeed, full of sugar plus custard / jam / nutella etc.) I’m not certain, but I think the broad principle in Italy is to eat the most sugary things for breakfast. I believe the less sugary biscotti (or tozzetti, or even sweet, but not too sweet, tarallucci) are mostly eaten after dinner with coffee and/or digestivo (xenomorph-blood-grappa or suchlike). Well, there we are – very informative! Thanks! These look so delicious, and we just love anything with almonds in. They’re a must. I noted that your favourite coffee shop was in Aberystwyth. My son went to Uni there and always bought his coffee and tea at The Mecca. I still buy my Earl Grey Blue Lady tea from them. I wonder if by chance The Mecca cafe, opposite The Mecca tea/coffee shop was your favourite? Thanks! I’m from Aberystwyth you see – We get our coffee from the Mecca when I’m back – the Mecca cafe closed down years ago :D… the coffee shop is still there though. Small world. This looks great, as usual! how long do the biscotti last? I’m going out of town to visit friends and would like to take a (baked) gift to them. Quite a while. At least 2-3 weeks. Those look perfect. Biscotti is one of my favorites. Here biscotti is a ridiculous price,(if you can find it). You have a nice recipe and your instructions are clear. Really? Crazy… thanks. I can get a small biscotti in my favourite Italian coffee shop for 12p each. They are small, but delicious. Oh, gracious. I’m so happy I found this blog. I have been trying to move away from buying expensive coffee and biscotti, and am trying to learn to make both at home. This looks like the perfect recipe! I have to say, your blog is truly one of a kind in the food-blogosphere. The focus is on practicality and wit, instead of just aesthetic. Which means the recipes you post have a much higher try-at-home rate for me! Keep it up! PS As an American, I’ll admit that stale chocolate chip cookies make a wonderful stand-in for biscotti when there isn’t any to be had. I just don’t have seconds! These are very simple! Great, thanks very much :D. It’s best to be unique… in a good way. I bake biscotti but have never tried an almond recipe. Thank you. However, I do need to find a conversion chart for measurements as we measure differently in the U.S.
Oh you must, it’s the traditional flavouring. Look at the top bar of my blog! I’m part Italian so our tradition is anise or vanilla flavoring. I will check the top bar of your blog.Thank you. Thanks! that sound delicious. almonds are a must! I will definitely try your recipe, looks yummy! Great! Let me know if you like them. My favorite…I love them with tea! Great – they’re good with any hot drink! Ahha – thanks for the info! 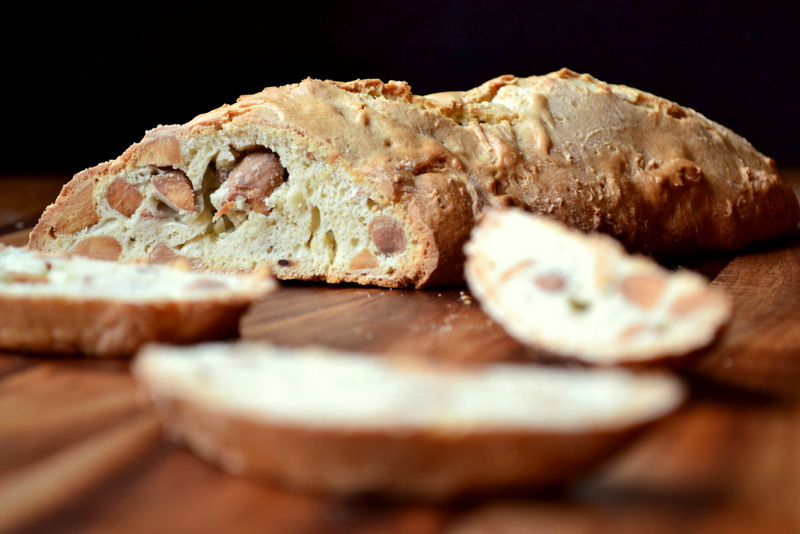 From my friends at Frugal Feeding… Almond Biscotti! I love biscotti – these look so good! Just made these today. They were great (yes, they are all gone). Went well with a cup of coffee (AM) or a spot of tea (PM). Thanks! Keep those recipes coming. I enjoy your blog very much! Thank you for the inspiration. Love almond biscotti – easy to put together, last a long time and delicious and then so versatile! Been meaning to experiment with savoury ones as well, have you tried a savoury version? Nope, but I shall! Just for you. Ooooh now that’s a very delish looking recipe. I am a heretic as I would scoff it with tea (and really bad put a thin layer of butter on the biscotti). Going to give the recipe a go later as I have those ingredients in my cupboards at all times. You might find it cheaper to get your almonds in an Asian or Chinese supermarket. Thanks! Not a bad idea! I got 600g of almonds for £2 – very, very cheap. Ok, I’ll try and factor in some marzipan soon! I believe that food can provide us with some of the purest pleasures in life, and your biscotti are such a beautiful example of that. Will be making myself a batch after work tonight. OH absolutely! Thanks – enjoy! I would love to dip these almond biscotti in a warm cup of coffee. I’ll take them dry too though because they look delicious just the way they are. So beautiful. The biscotti and your photographs. Looks really good! I´ve never been good of making biscuits or pudding, this year is a challenge for me and I´ll start to try making it, as I love almonds I will definitely try this one. Have a great weekend! Thanks! these are very simple! The Italians do any number of things better than us Yanks, and biscotti is most definitely one! Love the traditional almond biscotti and you’ve done it proud here Nick! Dip, dunk, and kudos to you! One of my favorite foods! These look lovely. I hope it serves you well!